Forest is an unincorporated community in Forest Township, Clinton County, Indiana. The town of Forest was platted on September 1, 1874 by Henry Y. Morrison to serve as a station along the Frankfort and Kokomo Railroad (later the Clover Leaf Railroad). The town's name was given because the site was forested, and the first railroad tickets sold there were issued from an oak stump used as a ticket counter. The town gained a post office in 1877 with C. G. R. Sims as the first postmaster. A reckless man undertook to establish a saloon here in the spring of 1886, despite the protests of the citizens, but after his building had been blown up with dynamite he decided to seek another location. As of circa 1913, the town had "about four hundred" inhabitants and considerable activity, including a bank (Citizens), three churches (Baptist, Methodist and Christian Holiness), and a number of lodges and fraternal organizations, including the Odd Fellows (172 men) and Rebekahs (58 women), Knights of Pythias (77 members), Masons (70), Improved Order of Red Men (48) and Modern Woodmen of America (26). As of 2016, Forest has much less considerable activity with only the post office and three churches still running. Forest is located at 40°22′25″N 86°19′58″W﻿ / ﻿40.37361°N 86.33278°W﻿ / 40.37361; -86.33278. ^ "Forest, Indiana". Geographic Names Information System. United States Geological Survey. Retrieved 2009-10-17. ^ Claybaugh, Joseph (1913). "Forest Township". 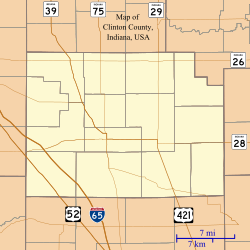 History of Clinton County, Indiana. Indianapolis: A. W. Bowen & Company. This Clinton County, Indiana location article is a stub. You can help Wikipedia by expanding it. This page was last edited on 9 August 2018, at 22:15 (UTC).